Loupes and Magnifiers are an essential tool for every coin shop and collector. 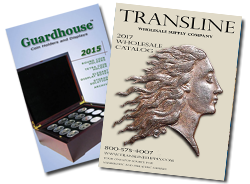 Transline Supply offers a wide variety of brands, styles and magnification powers to suit all your needs. Whether its plastic, metal, traditional or digital, Transline has the right loupes and magnifiers for you. You may shop by brand by selecting your desired category below.